Even though I don't have a plan for Halloween costumes, I have been thinking about Trick or Treat logistics. For example, both my kids are in a big 'Me do it myself!' stage, so I wanted to find a way to make a Trick or Treat bag that would stay open so my kids can collect candy without assistance. After a lot of noodling, I came up with closable-stay-open trick or treat Bag-- designed especially for toddlers and their moms! The way this bag works is that there is boning sewn about midway down the drawstring bag, along with a pair of handles. When the bag is held by the inner handles it stays open, forming a candy collecting basket. To close, simply flop the top part of the bag up and cinch the drawstring-- the extra handles and casing are hidden inside along with all your candy! The best part is that unlike those plastic pumpkins, these stow away in very little space along with the rest of your Halloween decorations. These little bags can be used for for a variety of fall fun-- collecting acorns and pretty leaves on those long walks. Let's get started! This is a fairly quick project that should just take a few hours-- even if you are interrupted by your little ones! . Note: To make this project super quick, I used ribbon for the handles, casing, and drawstring. You could substitute fabric/or bias tape if you prefer. This is the way that I make unlined drawstring bags for toy bags, gift bags and grocery bags. I'd just like to throw out a disclaimer-- there are 100's of drawstring bag tutorials and they all have advantages and drawbacks. To be honest, the only thing my method has going for it is that it's quick and lazy. 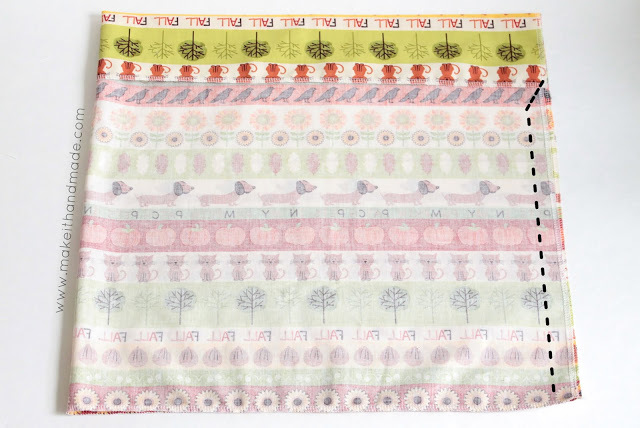 If you have a preferred method, or want to add a lining, or want to use an existing bag, that's ok! Just skip ahead to adding the boning. 1. Take your rectangle and finish all the sides either by overcasting or zig-zagging the edges. 2. Fold and press down an inch along the 36 inch long edge. Sew right over the overcast edge to form a casing. 3. Now you should have a a long rectangle with a casing along one edge. Fold your rectangle in half and sew the side seam with a narrow seam allowance (I use about 1/4 inch) starting from the bottom of the bag. When you get about half an inch from the casing, sew in diagonal to the edge of the casing as shown in the picture below. 4. Back stitch this small diagonal seam-- this will get a lot of wear and tear as the bag is opened. 5. Sew up the bottom of the bag. 6. Cut a yard of grosgrain ribbon. Thread the ribbon through the casing with a safety pin, and then stitch the ends of the ribbon together to prevent the ribbon from being pulled out of the casing. 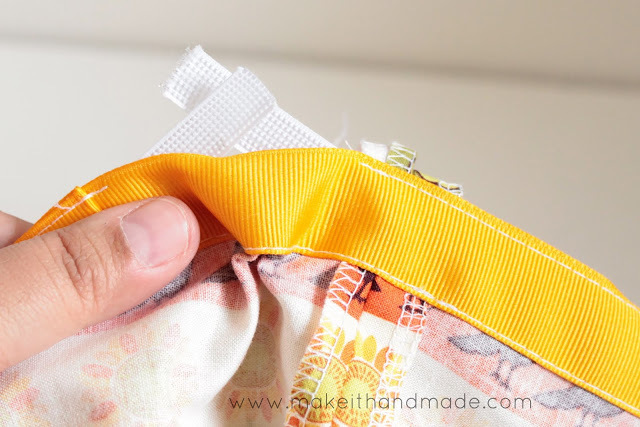 The main drawback to this method of making a bag is that you'll be able to see a tiny bit of the overcasting in the half inch where we cut across the seam allowance in step 3. You can see that in the picture above. The casing for the boning is grosgrain ribbon that is topsitched onto the inside of the bag. 2. Fold one edge of the ribbon to cover the raw edges. 3. 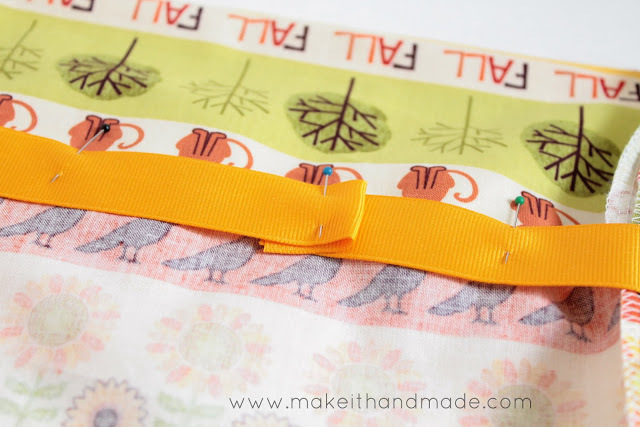 Sew both edges of the ribbon down leaving a small gap. Thread the boning through, and sew the gap shut. 4. (Optional) stitch two small lines over the the edges of the boning to make sure everything stays in place. That's it! Your toddlers are well on their way to trick or treating-- with or without help from mom. Is the candy in there yet? The little bags are already making our fall acorn collecting easier! I hope these little bags make your Halloween go smoothly too! Do you come here often? Subscribe or Sign up for Emails to make sure you don't miss my weekly tutorials! This is such a terrific idea. I love that they stay open by themselves, and the flip up drawstring...is genius! Does the draw-string ribbon just tuck away under the fold? Thanks for the tips...those plastic pumpkins are hittin' the curb outside our house. Thanks for the kind words! The drawstring ribbon is about the same length as the casing and sewn into a circle so it doesn't get lost inside the bag. When the bag is open it's all sucked into the casing, so you can't see it. I hope that makes sense! these bags would be good for grocery shopping too! What a great idea. Love the fabric choice! Cheers. Thanks! It's a Mliss print from Hancock Fabrics. I love your blog name, btw! this is a great idea for those legos that always get underfoot.. i think i might sew up a few as storage baskets/toy bags. thanks for the tutorial! I can't wait to make a few of these. I only wish boning were easily accessible in Hawaii.